The Eureka Cutoff is located in the Grand Mesa National Forest near Grand Junction, Colorado. The trail provides a short connecting route between the Green Mountain trail and the Eureka trail. 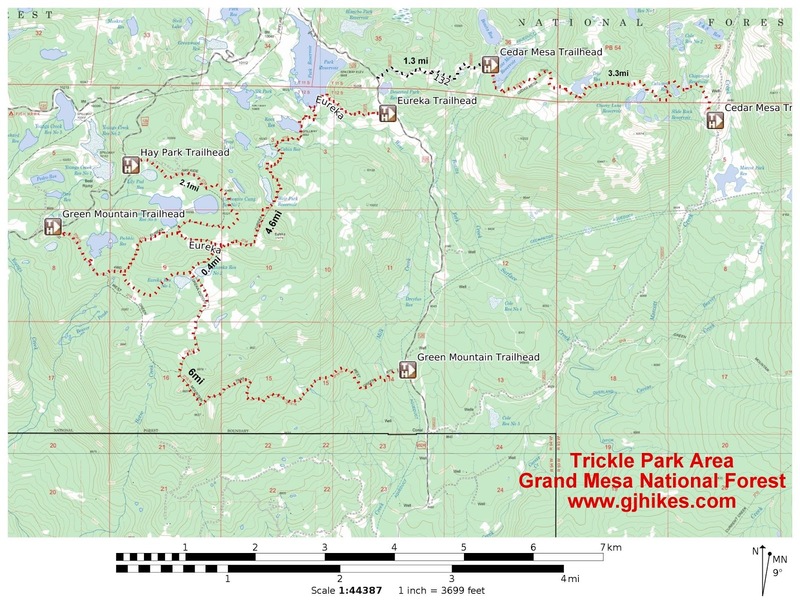 The trail gets most of its use from ATVers that are traveling a 10 mile loop made by combining the Green Mountain and Eureka trails with a section of the Surface Creek Road. For this post we began where the Eureka Cutoff meets up with the Green Mountain trail 1.9 miles from Forest Road #129 and 4.2 miles from Forest Road #125. The trail starts out paralleling the north side of the Eureka Number 2 Reservoir as it branches off from the Green Mountain trail. Going in this direction the Eureka Cutoff trail gains about 80 feet of elevation. The grade is flat enough that the elevation gain is barely noticeable. Even though we were hiking the trail most of its use does come from ATVs. The Eureka Cutoff trail meets up with the main Eureka trail in a large meadow. Going to the right from here it is 3.3 miles to the Surface Creek Road, FR #125. To the left it is 0.4 miles to the Hay Park trail and 1.2 miles to where the Eureka trail meets up with the Green Mountain trail. 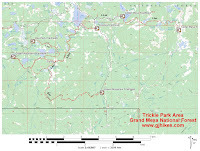 The map that we have included will come in handy for planning various combinations of trails to meet your needs. Note that at present we don't know of any commercially available maps that show the current routes taken by the Green Mountain and Eureka Cutoff trails. If you would like to see it for yourself then all you have to do is 'Take a hike'.